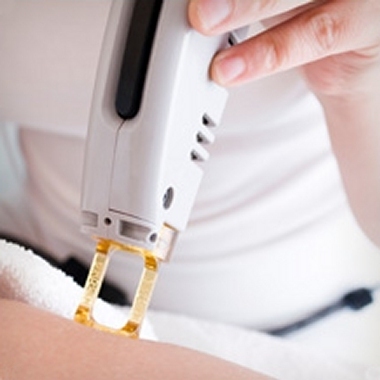 Laser hair removal can be performed effectively on most people. A few limitations to the technology must be considered. The hair must contain enough pigment to absorb the light, which means blond, white or grey hair will not work. All skin types can be treated but the treatment works best on light to medium skin tone with darker hair. The skin must be its natural color. A tan to the skin during treatment can cause a burn to the skin. Some medications and medical conditions prohibit a person from safely having laser hair treatment, consult your technologist if your have any questions. The feel of laser treatment is relatively painless. The Candela GentleLASE's cryogen spray helps cool the skin an instant before the laser fires and makes the treatment more tolerable. Usually the feeling is described as a rubber band snap or a scratch. The feeling from the laser application goes away within seconds. Sometimes there is a "tingling or tender" feeling to the area that has been treated for a short time after. In most cases you will feel as though nothing was done once you leave the office. The skin may be slightly red and have some swelling around the follicles right after treatment. This redness and swelling will fade away quickly. The hair in the area will often be singed but will not fall out or shed for 10-14 days after treatment. You will notice less hair in the area until the next growth cycle when the area is ready to be treated again. With each treatment, you will see less hair coming back and the texture will be lighter and finer. Can I tan while having treatment? Tanning and laser hair removal are not compatible. Tanning prior to the procedure will result in negative side effects, such as soft scabs, burning, change in pigmentation, and in severe cases, blistering and scarring. Because of these possible adverse reactions, we will not perform treatment on tanned skin. You may tan areas other than those being treated. You may also use self-tanning products as long as the tint is worn off before your treatment. Self-tanning products typically wear off within one week after application. Try our safe, effective, and affordable laser hair removal! No pressure on selling you big packages, pay-per-treatment as needed. This often results in cost savings over package pricing plans. We have tried many lasers and have found the Candela GentleLASE laser gives the most consistent and lasting results. It provides comfortable treatment because of a patented cryogen skin cooling device, resulting in a light that treats with a puff of cold air. The GentleLASE laser uses a specific frequency that seeks out pigment cells. Dark hair contains large amounts of this pigment and attracts the light energy of the laser. The laser energy travels down the hair follicle and destroys or damages the root and cells that nourish a hair under the skin's surface. The Laser cannot detect hair without	pigment such as blonde, white or grey, and cannot treat this type of hair. Discomfort - A quick stinging or hot sensation as the light fires. Redness - generalized or centered around the follicle. Lasts a few minutes to a few days. Swelling - around the follicles. Lasts a few minutes to a few hours. Soft Scab - Small crusts especially to darker pigmented areas (freckles, birthmarks, moles). Folliculitis - Infection of the hair follicle, similar to a pimple. Pigment Changes - Hypopigmentation lightens the skin especially if the area is tan. Hyperpigmentation darkens the area , more likely to happen on dark skin. These changes usually resolve over a period of time and can be helped by exfoliating or bleaching creams. Burns or Blisters - These are rare and generally mild, healing quickly. Most common on tan or darker skin. Client would want to keep area moist with Polysporin and not pick at any scabs. Area will heel in about a week. Photosensitive medications should be stopped 48 hours - 2 weeks prior to having treatment depending on medication. People with diabetes should not have treatment on extremities and require a physician's note. Women should refrain from treatment during pregnancy due to hormone shifts and subsequent hair growth, but may receive treatment with physician's permission.